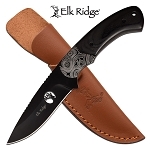 The wholesale knife 4 inch blade is very sharp and the 4.3 inch handle has a comfortable grip. This hunting knife for sale is for your outdoor hunting adventure. The knife is available at wholesale knife price so it's a cheap knife. The wholesale knife 4 inch blade is very sharp and the 4.3 inch handle has a comfortable grip. The overall length of this knife is 8 inches long. A very nice genuine leather sheath is included with the knife.